Morocco has beautiful interior decoration which becomes the signature of this country. The ethnic decoration is something that people interest at, not to mention the artistic value of each item which makes it very special. Many kinds of colors that use in this style makes the room feel vibrant, you can also use this Moroccan home décor on your house to achieve the same feeling. It is very easy since there are some items that you could add to your house to create Moroccan style home. Fabric is a signature item that you should use when you want to create beautiful Moroccan home. Let the fabrics flow from everywhere around the room, from the ceilings to the walls, even in front of the doors. If it is possible, try to make a canopy ceiling, however if you think that is too much, then just let the fabrics flow from one chandelier to another. You can use colorful fabric which is the signature of Moroccan themed house, but if you want, then you can also use only one color fabric which thin and flow everywhere. Moroccan lighting is very unique since they have pattern on the shade which will form some light pattern on the wall when you use it. This is what make Moroccan home décor feels romantic and unique. That is why you should try to use Moroccan lighting if you want to get the authentic feeling on your house. The ceiling lamp is a must, but if you could find some sconces then you should try to use it. Lantern is another option to use, you could find all of those lighting on import store near your house. If you visit Moroccan house, first thing that you will notice is the unique pattern of the tiles that they use around the house. Of course, you do not need to apply tiles to your entire house when you want to use Moroccan home décor ideas. However you could try to apply it on important places as the accent point of the room such as on the trims of your ceiling and flooring. Bathroom is another place where you should use the tiles on, especially on your bathroom countertop. On the kitchen, you can add the tiles on the backsplash. Then you can also use it outdoor on your fountain tiles. Morocco has very beautiful carpet style, which might be the reason why every house always uses carpet on their floors. Not only one but it seems every room has one carpet or two. This carpet is used to add the warm feeling on the Moroccan home décor. That is why you should also use some inside your house. The easiest is to use it on your living room and of course on the bedroom since it could add added beauty to it. But if you have extra fund, then you can even add morocco rug on your halls. You will see that a lot of items on Moroccan house is made from bronze or has bronze color. Of course, you should not use such items, but you can still use those items as part of your Moroccan home décor items. Just visit your local import store and choose some bronze items that you could place in your house. Not only items that you could place on the table, but you should also choose several items that you could hung on the wall such as mirror or wall arts. 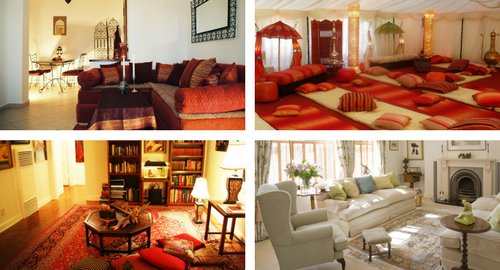 To complete your Moroccan home décor, you can try to use Moroccan furniture. Of course you might not be able to find authentic furniture unless your local import store has them. But you can find several pieces which inspired from Moroccan furniture. Choose big fluffy sofa and bed since the signature of their furniture is fluffy furniture pieces. But if you still want to use your old sofa, then you can try to use fabric sofa cover which suitable with this theme and just throw a lot of fluffy pillows with Moroccan style pillow cover on top. Morocco uses a lot of warm and bold color on their house. That is why if you want to let your wall bare and not using too much fabric, you can try to paint your wall with those colors. Use different kind of colors on each room to create dramatic changes. But make sure that the color you use is suitable with the Moroccan home décor color that you want to apply later. Earth tone red, blue, orange, and other earth tone color can be used in the room. Unite all of the color so you could create beautiful Morocco inspired room.